There I was sitting in my car figuring out what to do. I had at least an hour and a half to kill before I had to make it into work. I sat there for a while listening to my favorite music station on Pandora: Amos Lee. This station brings such peace and clarity into my mind. I wasn’t thinking of much, just staring out the windshield letting the sun warm up my cheeks. For some reason I felt compelled to look right. 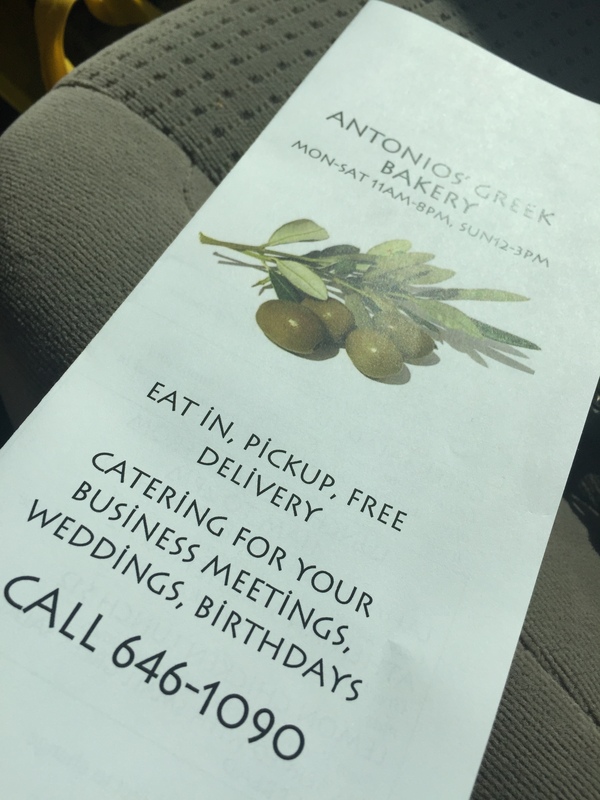 There it was, a sign that said, “Antonio’s Greek Bakery.” Without hesitation, I turned my car off, open the door, step outside, and started walking right to the entrance. As I started heading for the door, I knew exactly what I was going to get. Not for myself, but for someone else. Randomly, I like to do nice things for people or give them a small token to let them know I was thinking about them. The mission: I hope they have baklava. Standing outside of this Greek bakery, I could see through the windows of something cute and itty bitty. It was a place with very few tables and minimal décor, which I found charming. Shortly, I opened the door, to notice I was standing in there alone. A counter in front of me filled with a display of decadent Greek desserts caught my attention. Music filled my ears and the room gave off the fragrance of cinnamon, roasted nuts, and honey. Standing there silently, I noticed this little kitchen behind the many delightful desserts I soon wanted to devour. I saw a mans head moving back and forth through the window. I smiled and said, “hello.” As soon as he noticed I was there he came out of the kitchen divided by a little door. With flour on his face, wearing a white apron stood an older gentleman with a little hair on the top of his head. He greeted me with this comforting smile and these warm inviting brown eyes. I didn’t ask the man what his name was, but for now, I’ll call him Antonio. Antonio and I spoke for a brief 10 minutes about his bakery and the desserts I was looking at. 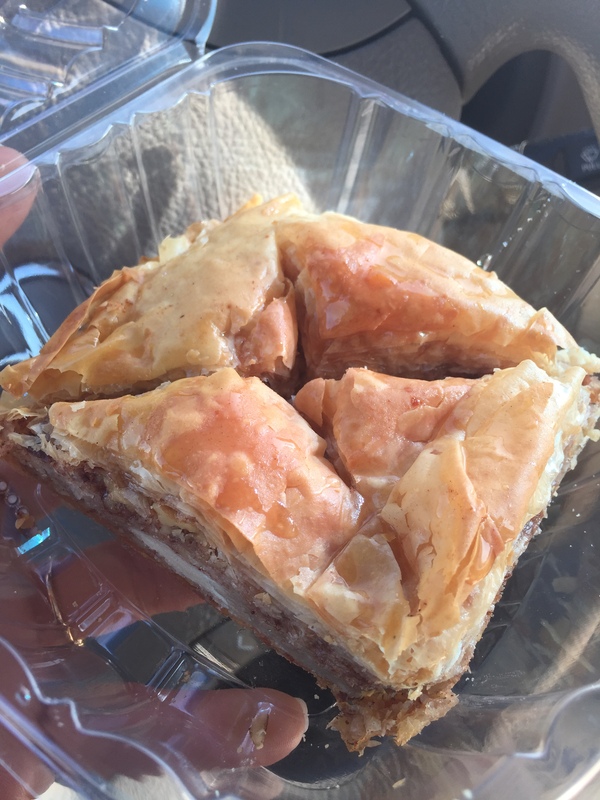 I had my eyes on the baklava and I told him I’d like to buy some for a friend. After laughing and exchanging a conversation I’d remember for a long time, I found myself paying him for what I came there for. With his exceptional hospitality, I told him to keep the change. With the look on his face, I can tell that I caught him by surprise and he told me, “You wait there, I have something delicious for you I want you to taste. It will be the best dessert you’ll ever have,” and he disappeared into that tiny kitchen. A moment later he popped out of the kitchen with this little plastic box filled with a dessert I’ve never tried before. He described it telling me it was nice custard baked in between phyllo dough. It was topped with a honey simple syrup and a little sprinkle of cinnamon. Looking at him while he described it brought me home. It brought me to a place I’ve been longing for a while now. Antonio reminded me of something, he inspired me. Shortly I thanked him, asked him for a business card, smiled, and walked out the door. 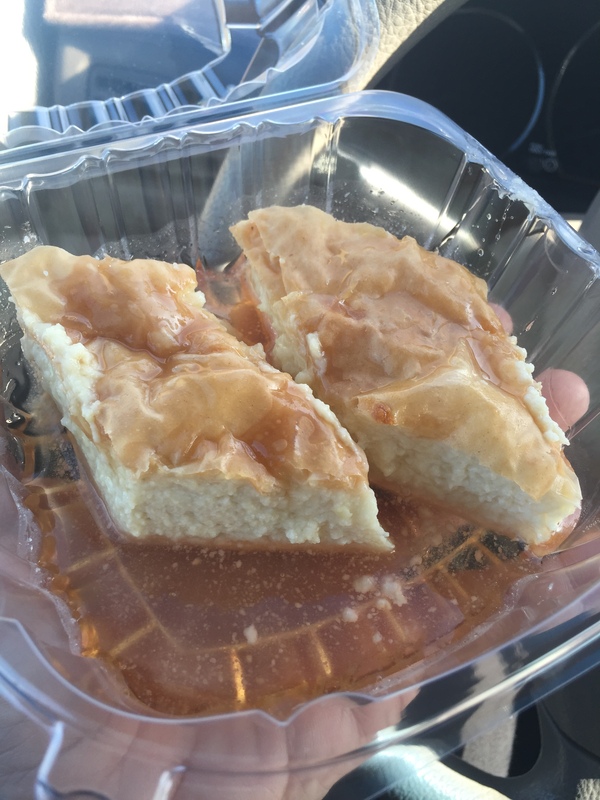 As soon as I got into the car, I just knew I had to try this dessert and a little baklava. The smell of them both in front of me made my mouth water. This creamy custard had this flaky, buttery phyllo on the bottom and top of of it. The subtle sweetness of the custard complimented the warmth of the honey syrup that went with it. I was in heaven. With that being said, I’d like to say something. You made me remember why I do what I do. By the nice simple gesture of giving me a dessert you insisted I try, reminded me that I cook for the pure gift of sharing that passion with people around me. You showed me with your eyes and your words that this bakery wasn’t only about the business, but because you love what you do. Your passion radiates off of you and without you knowing, you made mine brighter. You’ve inspired me, which is why I had to write about you. I was in a place where my passion was dimmed with confusion and you sparked it. You sparked something so deep inside me and now my passion burns with a fire that can’t be tamed. And now, I’d like to thank you for all of that. Thank you stopping by my blog. Thank you for stopping by! Baklava deff feels and smells like home. I heard something once from the singer of Tool. Sure, Tool may not be everyone’s favorite but his story telling stuck with me. Basically, in life their artists and profiteers. If someone works for the sake to create something than the by product will be wealth. What the wealth maybe is the question. For some it could be money. Like selling a Rembrandt. It could also be about creating joy, an experience, or inspiring someone. Sure Antonio made a few dollars but he also inspired you enough to write about it. That makes Antonio a blessed man. Conversely, at the General Foods factory they are pumping out frozen meals en mass to a store. The aim is to make money. The CEO makes a lot of money but no one is inspired to become a chef after eating a meal in a box. The faceless cooks ensure the process is efficient. When the CEO retires, no one will care. He maybe financially rich but what comes with creating solely for profit is a life of crunching numbers and sterility. Also, thanks for dropping by my site! I need to proof read before I hit the send button! Ha ha!